Bear Creek Adventures, LC, wedding services, horse drawn carriage ride. "The horse-drawn carriages from Bear Creek Adventures are the perfect way to add old world charm and elegance to your wedding! The professional and courteous staff at Bear Creek will make sure everything runs smoothly so you can enjoy your day." Old West style or formal, your place or ours, our horses, carriages and wagons will make your wedding day memorable for years to come. If you are planning a formal wedding, Bear Creek Adventures can provide you and your party with an elegant vis-a-vis (carriage) pulled by a handsome draft horse adorned with rosettes and ribbons that match your wedding colors and driven by a teamster sporting a tuxedo and top hat. If old west is more your style, you are in luck here too. How about an authentic covered wagon for a backdrop? Please contact us for ways to customize your wedding. 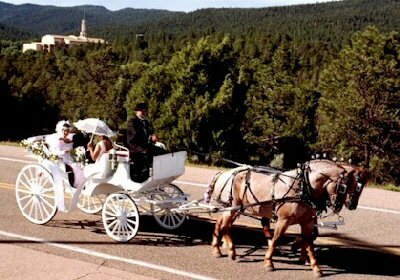 We are the first and only carriage company permitted by the city of Santa Fe to offer Horse Drawn carriage and wagon services within the Santa fe plaza. We have been in operation since 1992 and have done many different types of weddings and events. We also offer several vehicles and teams to accomodate your every wish, from transporting the bride and groom, to the entire wedding party. We will make your wedding day unforgettable. Reservations and a 50% non-refundable deposit are required. Call us for more information. $700.00 Base plus $100.00 per hour after two hours, plus $4.00 per mile if over 25 miles from Pecos, plus Tax.